Introduction: Laparoscopic sleeve gastrectomy (LSG) is an accepted bariatric procedure, either as a first step for biliopancreatic diversion or gastric bypass, or as a standalone option for selected patients. 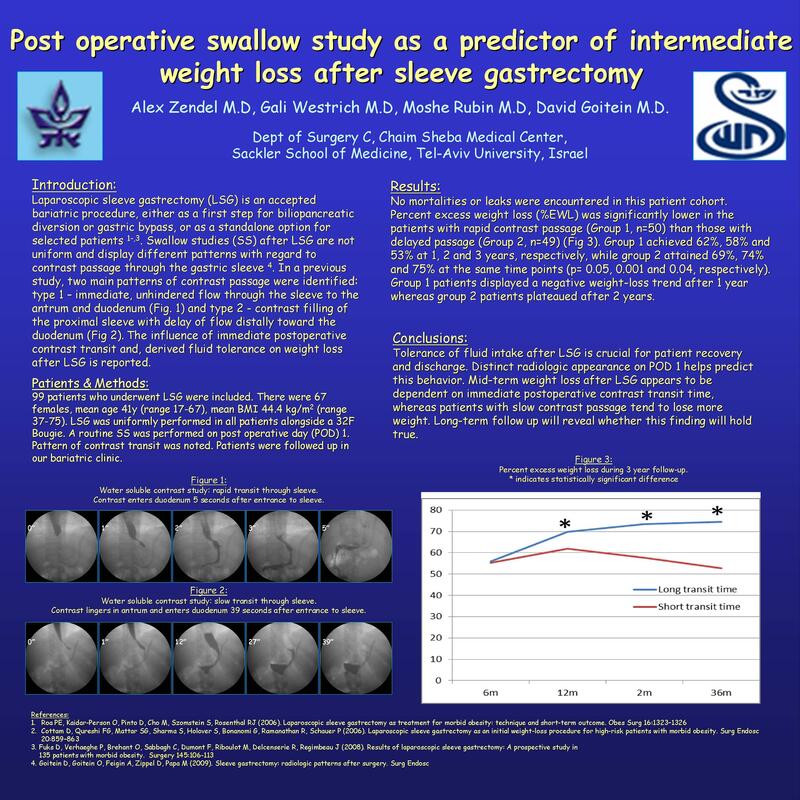 Swallow studies (SS) after LSG are not uniform and display different patterns with regard to contrast passage through the gastric sleeve. The impact of immediate postoperative contrast transit time on weight loss after surgery has not been studied. The influence of immediate fluid tolerance on weight loss after LSG is herein reported. Methods: 99 patients after LSG were included. There were 67 females, mean age 41 (range 17-67), mean BMI 44.4 (range 37-75). A routine SS was performed on post operative day (POD) 1. Pattern of contrast transit was noted. Patients were followed up in our bariatric clinic. Percent excess weight loss (%EWL) was significantly lower in the patients with rapid contrast passage (Group 1, n=50) than those with delayed passage (Group 2, n=49). Group 1 achieved 62%, 58% and 53% at 1, 2 and 3 years, respectively, while group 2 attained 69%, 74% and 75% at the same time points (p= 0.05, 0.001 and 0.04, respectively). Group 1 patients displayed a negative weight-loss trend after 1 year whereas group 2 patients reached a plateau after 2 years. Conclusions: Tolerance of fluid intake after LSG is crucial for patient recovery and discharge. Distinct radiologic appearance on POD 1 helps predict this behavior. Mid-term weight loss after LSG appears to be dependant on immediate postoperative contrast transit time, whereas patients with slow contrast passage tend to lose more weight. Long-term follow up will reveal whether this finding will hold true.